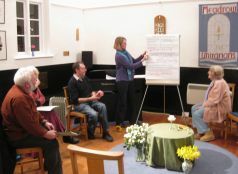 We run occasional study and self-development groups covering a range of topics. Previous groups at Meadrow have included – ‘Build your own Theology’, ‘Soul Poetry’, ‘Spirituality in Everyday Life’, Ageing, Parenting, Work-Life issues, ‘Twelve Steps to a Compassionate Life’, ‘Spiritual Practice’, ‘Simply Pray’ and ‘Mindfulness based Stress Reduction’ courses. On the first Sunday of each month, after the service, some members of the congregation organise a scenic walk in the local area, followed by a pub lunch or picnic. We also host occasional Saturday workshops and concerts. For up to date information on what’s on at Meadrow, see the calendar page. Twice we have enjoyed a long weekend away at the “Nightingale centre” – the Unitarian holiday and conference centre in Great Hucklow in the Peak District – and once at the Othana Centre in Dorset. These weekends are a great way to get to know other members of the congregation and include a range of recreational and creative activities.